On November 19, we launched our 43 Day Campaign. The goal of this campaign is to raise $43,000 in 43 Days in order to triple the number of PFL scholarships, further expand our Elementary School Adapted PE field days and dramatically expand the number of students using our 43 Lessons to Legacy character development curriculum in 2018. We have already seen great success and Lutzie 43 Foundation thanks you for your support of our initiatives. Due to the campaign’s success so far, we have decided to have a fun giveaway we know you will be excited about. 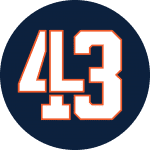 The first five people who donate $430 on December 15, 2017, will win a limited edition #43 Lutzenkirchen navy jersey! Your $430 donations, however, will do much more than provide a jersey. Your $430 donation provides a DJ for a special needs Joy Prom. Lutzie 43 Foundation currently provides a DJ for one special needs prom in Decatur, AL, and we wish to expand to others. Philip had a heart for those different than him, so the foundation is passionate about providing for those with special needs. Higher donation amounts provide transportation for special needs students to attend Elementary School Adaptive PE Field Days. Bus transportation with wheelchair lifts is incredibly expensive for schools, so Lutzie 43 hosts field days and provides transportation for the students. Watch a video of the 2017 Adaptive PE Field days here and learn more about the field days here. A $4,300 donation will sponsor a PFL (Prepared for Life) Character Scholarship, a character-based scholarship eligible to students nationwide. We awarded 5 scholarships this year and plan to grow that number in 2018. Learn more about the scholarships here. We ask that you consider giving to this important initiative. If you are inclined to give this donation, visit our campaign page here. Winners of the #43 Lutzenkirchen jersey will be announced after the first five donations of $430 are given on December 15.